We previously discussed the importance of having a well thought out strategy and focusing on the right products or services to deliver that strategy. Now let’s discuss the importance of having an efficient Marketing & Sales program to generate revenue for your business. Most successful business owners realize, no matter how efficient your operations are, if you don’t have sales, you won’t survive. This means time and effort must be spent creating awareness and interest in your products or services. And enough sales generated to support your operations and earn a profit. Spending time developing and growing your marketing and sales programs is time well spent. A simple way to think of marketing and sales efforts is like a funnel, as shown below. External marketing also includes strategic relationships with partners, affiliate companies, and others that might refer or send customers to you. These are critical relationships for every business to form, and help “fill the funnel” in terms of introducing potential new customers to your business. As a company, your goal should be to maximize the size of the external marketing “funnel” so as to reach the largest possible audience of potential customers. It is important to remember that existing customers are much cheaper to sell to than new ones. Leverage your existing customer base by communicating with them about your products/services and remind them of how much they like being your customer . A simple monthly newsletter or promotion highlighting a new product, a sale, or valuable expertise will greatly enhance the likelihood of that customer coming back to you when they need something else. Customer newsletter, promotions and loyalty sales – expand the likelihood of a customer coming back to you when they are considering another purchase. Feedback survey – ask your customers how you did, where you can improve, and if they will refer you to their friends. It’s amazing what can happen when you simply ask them to spread the word. Employee training – ensure your employees know all your products and can speak about them when a customer calls. From this high-level overview, how confident are you that your business has an effective Marketing & Sales program? 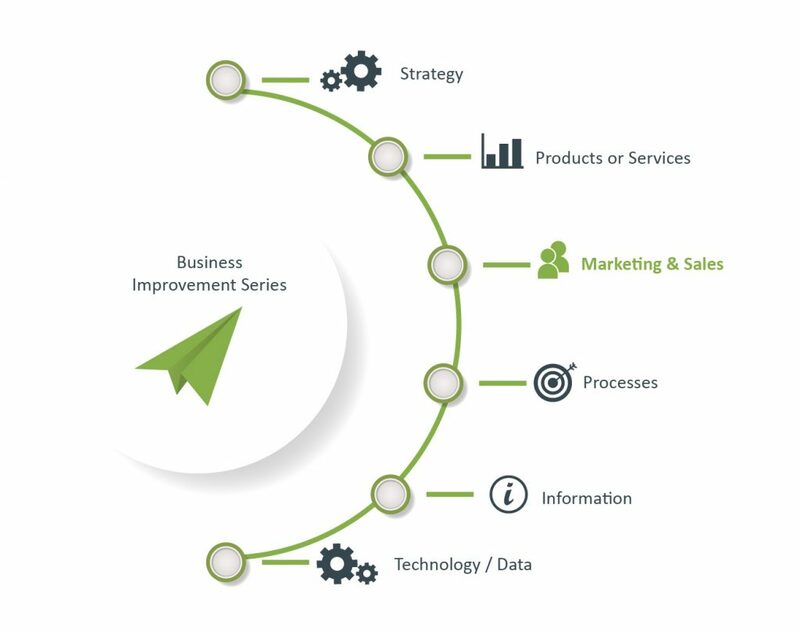 If you’d like to discuss further, give our Business Improvement team a call and we would be happy to discuss solutions. We are experts at this, can determine the best solution for your unique situation. Based on the results drawn from marketing and sales activity operations and processes ensure sold products and services get delivered on time and on budget.